Leading by one run in the eighth inning against top-seed South Carolina, Maryland head coach John Szefc called upon his trusted closer to get the Terrapins out of a jam. Kevin Mooney walked to the mound with the tying run on second base and one out. In typical fashion, the then-sophomore took the top of his cleat and wiped the rubber clean. Then, he promptly hit the first batter faced. He got the next batter to ground into a fielder’s choice, leaving runners at the corners with two away. He fell behind the ensuing hitter, leftfielder Gene Cone, 3-0, not trying to give him anything to hit. Then, after a swinging strike and a foul ball, the count drew full. 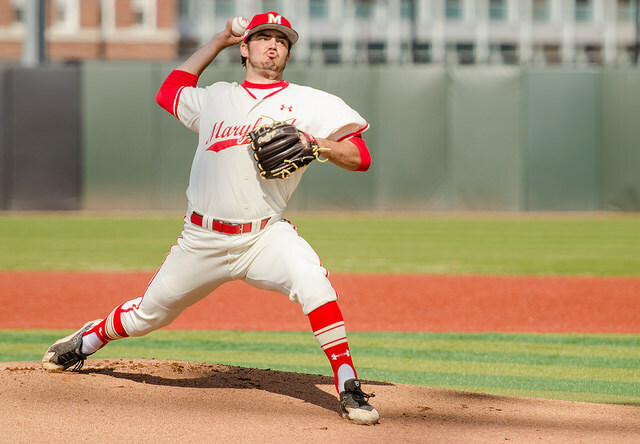 “We called a 3-2 curveball in the dirt,” former Terps catcher Kevin Martir said. The 6’1” closer delivered. Cone swung and missed, and Martir blocked the ball and threw to first to retire the side. The Terps went on to win, 4-3, and defeated the Gamecocks the following night as well to secure the first NCAA regional title in program history. 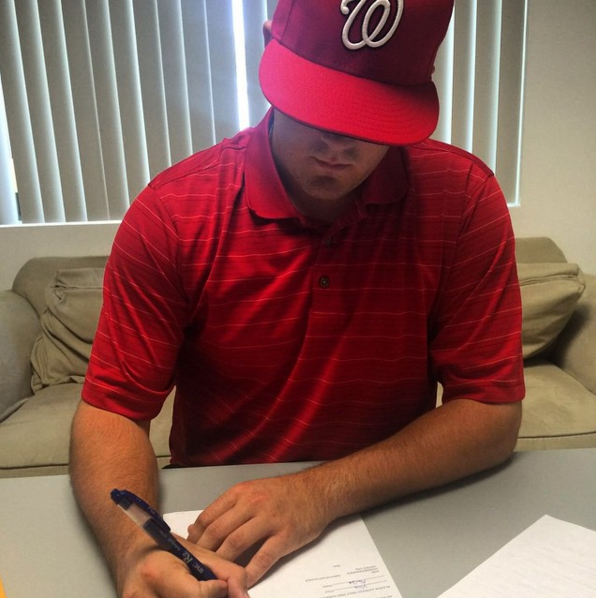 Just over a year later, the former Terps closer was drafted in the 15th round of the 2015 MLB Draft by the Washington Nationals. When Mooney’s name was called on the third day of the draft, he wasn’t glued to the live stream. He watched the first two days with teammates, friends and family at Looney’s Pub, and watched as teammates second baseman Brandon Lowe, pitcher Alex Robinson, outfielder LaMonte Wade and pitcher Jake Drossner were selected. Mooney, a junior at the time, had the option to return to College Park for a final season. Prior to the draft, he decided with his family and advisor that unless a team offered at least a certain amount of money and allowed him to return to the university to finish his degree, he would choose to come back to the university. Mooney was an All-Academic performer throughout his time in College Park. So, after day two of the draft, Mooney was indifferent, and had come to terms with not being drafted and returning to the Terps for another year. 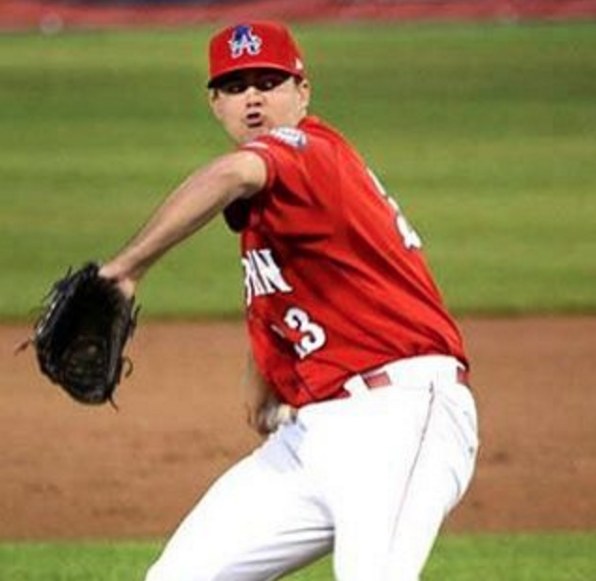 But, he was still on the radar of all but a few of the major league teams, including the Nationals, who began scouting him the summer after his freshman year, when Mooney played for the Falmouth Commodores in the Cape Cod League. The first baseball glove Greg Mooney gave his son was meant for a left-hander. Greg, a left-hander himself who pitched collegiately for one year with Towson State University (now Towson), hoped Kevin might be left-handed as well. It wasn’t as if Greg was trying to force his son to be left-handed, though, Greg said. It was just wishful thinking, as lefties are considered more valuable due to the abundance of right-handers. Greg was his son’s coach throughout his youth baseball years, coaching all of his travel teams until Mooney’s junior year of high school. The two found themselves, day-in and day-out, traveling to the nearby field in his hometown of Forest Hill, Md., to practice. On the third day of the draft, Lowe, who broke his fibula rounding first base in the Terps’ final game of the season, asked Mooney to help him pack up his things in the team clubhouse. Entering the locker room, the two found then-sophomore pitcher Mike Shawaryn packing up his things as well, as he was getting ready to play for Team USA over the summer. Shawaryn had the online stream of day three of the draft open on his computer, but Mooney wasn’t really paying attention. Mooney might not have been watching, but his father, with whom he’d practiced with nearly every day of his childhood, certainly was. In fact, Greg Mooney has a screenshot of his son’s name on the draft tracker saved to the desktop of his computer. “As his father, it was a bit stressful, but seeing his name pop up and getting that call was certainly one of my proudest moments,” he said. Mooney was a two-sport athlete growing up, playing baseball and soccer. But, after making the varsity baseball team at North Harford High School as a freshman, Mooney began playing fall baseball his sophomore year, spelling the end to his days on the competitive soccer field. Baseball became a year-round endeavor, and focus turned toward the prospect of collegiate baseball. It was then—during Mooney’s sophomore year—that his father began recording video of him. Originally, the videos were destined for YouTube to show out-of-state college coaches, but it soon became a learning tool as well, as Mooney and his father would sit down and compare it with the videos the two watched of professional pitchers when Mooney was younger, focusing on mechanics. MORE: Jake Eisenberg talks with Kevin Mooney about the Terps’ all-time saves record prior to the 2015 season. While the two examined a variety of pitchers, the main focus was Hall-of-Famer Nolan Ryan because of his status as a power pitcher and his longevity, not to mention he was Greg’s boyhood idol. But, while Ryan was famous for his flamethrower fastballs, what separated Mooney was his curveball. Mooney learned how to throw a curveball for the first time when he was eleven years old—starting slowly, mostly focusing on the grip and the release point his father showed him. By the time he reached high school, he felt more and more comfortable throwing it for a strike and more confident that batters wouldn’t be able to handle it. Upon arriving at Maryland, the curveball was fully entrenched in his arsenal. The pitch had a tight spin and a traditional “12-6” vertical break, movement that’s more difficult to pick up than that of a pitch moving laterally. Galligan and Mooney were throwing partners during this past season, and would work occasionally work on each other’s curveballs. It became Mooney’s “out” pitch, to the degree that with two strikes and two outs, he could tell when it was strike three and would start taking steps toward the dugout. “When it’s halfway to the plate, I can tell, ‘O.K., this is going to be a strike,’ Mooney said. “Knowing, ‘I got this guy.’ I know his knees are buckled; he’s going to flinch back a little bit. Despite entering Maryland as a starter, Mooney slid comfortably into the closer role, notching nine saves his freshman year. The following season, he tallied 13, tying the single-season program record set by Brett Cecil, now a closer for the Toronto Blue Jays. That season also brought his career total to 22, one shy of Cecil’s career record. Mooney broke Cecil’s record early on in 2015, earning the save in a 12-9 win over Minnesota on March 21. But, he wouldn’t stop there. Entering the 2015 postseason, Mooney had just five saves on the year. The Terps won six games in the 2015 postseason, and Mooney earned the save in every one, striking out the final batter in five of them, each with the curve. 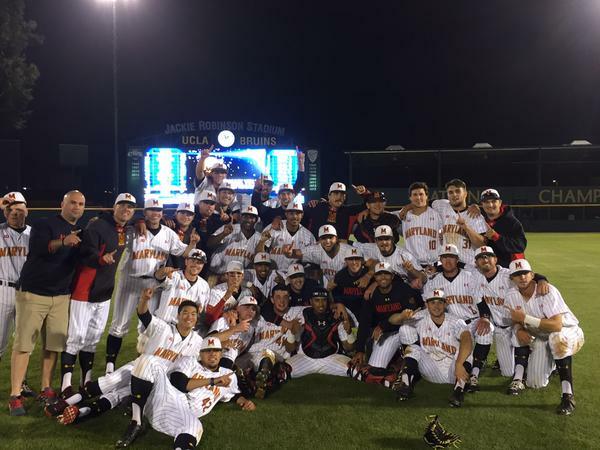 The Terps knocked off UCLA at Jackie Robinson Stadium to claim their second straight NCAA Regional title in 2015. The six postseason saves, including two against top-ranked UCLA in the Terps’ second straight NCAA regional win, brought Mooney to his career total—and new program record—of 33, the same as his jersey number. Today, Mooney is back on campus—a month away from graduating from this university with a degree in Geographic Information Systems. He’ll graduate with honors, and in just seven semesters, thanks to taking classes over winter and summer breaks. This semester, Mooney is taking six classes—three of which have labs—good for 16 credits, all while working in an offseason schedule in preparation for the upcoming minor league season. Last year, he was with the Auburn Doubledays, a Single-A Short Season team, but hopes to find himself in Hagerstown, the home of the Nationals Single-A club, soon. Upon graduation in December, just in case, he’ll have a fallback plan. But, as long as there’s a shot at the major leagues, it won’t matter. With already one season of minor league baseball under his belt, the Maryland native is a step closer. “The light just got a little bit brighter,” Mooney said. Vittas: Mooney has established himself as one of the better closers in college baseball over the last few years. He’s closed out big games in hostile environments without fail and isn’t phased by anything. Both his fastball and curveball are true swing-and-miss pitches and his curveball has more downward break than any pitch I’ve seen doing college baseball. The only cons to Mooney’s resume is that he has struggled with control in low-leverage situations and as a starting pitcher. Lewis: Mooney has been tough as nails serving as the everyday closer since his freshman year. He has amassed over 30 saves in his three year stint as closer, good for tops in program history. His fastball tops out at 94 mph and his signature pitch is his true downer 12-6 CB that he can throw in any count. His curveball is a plus pitch that is in the 78-80 MPH range. His polished command of this 2-pitch mix makes him a top-10 round talent as a short inning reliever. With a couple more ticks on his FB and the addition of a 2-seamer or a FB with some run could elevate Mooney to a closer’s candidate at the next level. Expect him to go in the first half of the draft, potentially in the top 10 rounds.